Welcome to my low carb life..
Preheat oven to 450° F. Line a baking sheet with foil and spray lightly with cooking spray; set aside. Brush mushroom caps and edges with oil. Sprinkle stem-side with salt and pepper and place, rounded side down, on baking sheet. Divide cheese among mushroom caps and bake 10 minutes or until cheese begins to melt and edges begin to brown. 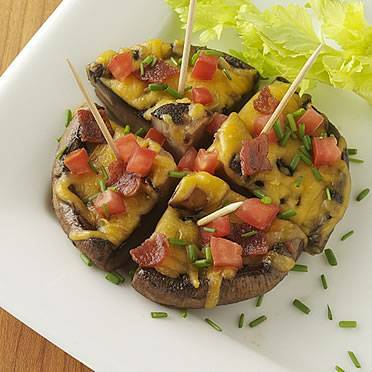 Remove baking sheet from oven and sprinkle bacon, tomato and chives over mushrooms. Return baking sheet to oven and cook an additional 5 minutes, or until cheese is melted and mushrooms are hot. If desired, cut into wedges and serve with toothpicks. this recipe originally from the Mushroom Council~ low fat cheddar and turkey bacon removed to include regular cheddar cheese and bacon. LOVE the LOW CARB LIFE! Coffee “drinks” can be carb loads! Another reason to avoid Carbs! Enter your email address to follow Carb Kick and receive notifications of new posts by email.